The park itself is a visual contrast of dense primary rainforest and barren volcanic badlands, where 3,000 years of molten rock and lava have scarred the landscape with igneous rock, deep craters and hardened ash. Trail hiking inside the park, including over old lava flows. Birdwatching is superb. Coveted sightings include the resplendent quetzal, keel-billed toucan, laughing falcon, dull-mantled antbird, great potoo, various tanagers, and the endangered three-wattled bellbird. Horseback riding tours skirt the park proper. Arenal Volcano cone. Behold from afar, but note that you cannot climb the volcanic cone (due to the danger of poisonous gases). An ancient ceiba tree 400-years-old and measuring 131 feet. Magnificent views great for nature photographers. Find sweeping panoramas of Lake Arenal, and the Tilarán mountain range. La Fortuna Adventure activities are big in La Fortuna (often referred to as “Arenal”), and range from serious adventure (waterfall rappelling, caving at Venado caverns, Class III-IV whitewater rafting, mountain biking, ATV tours, canopy zip-lining, windsurfing, waterskiing, wakeskating, and wakeboarding), to mild adventure (safari floats, class II-III whitewater rafting, lake kayaking, hanging bridges, waterfall/volcano hiking, and horseback riding). Volcano-fed hot springs rumored to have medicinal properties, are very popular in the area. Tabacón, with its incredible botanical gardens, is the most famous, while Baldí is known for its waterpark-like family feel (including waterslides). Many other hot springs have cropped up, including at several of the area’s midrange and luxury hotels. Arenal Volcano National Park is 29,692 acres in size--about twice the size of Manhattan. 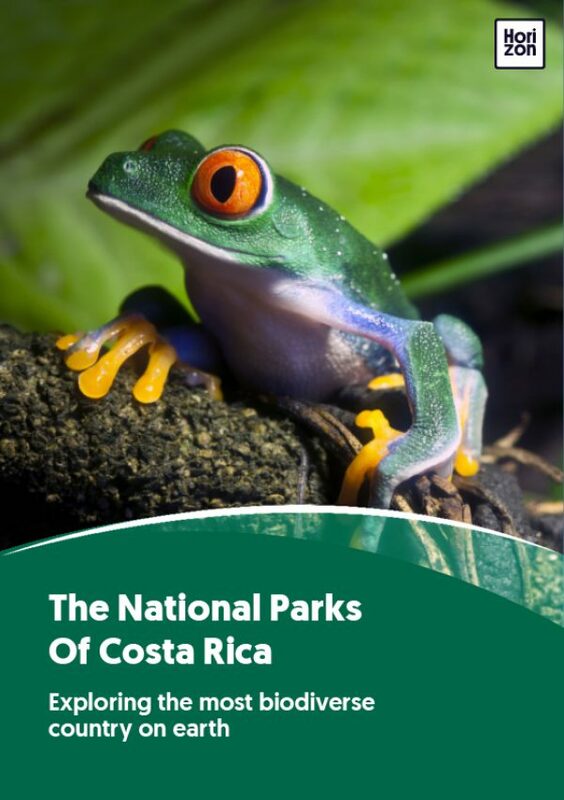 The park was established September 30, 1991 and is Costa Rica’s fourth-newest national park. You’ll find potable water, parking, and restrooms at the park entrance. A lookout point (volcano and lake) is a short hike from the main entrance. No camping is permitted at Arenal Volcano National Park. Choose from three hiking trails--Las Heliconias Trail, El Ciebo Trail, and Las Coladas Traill--measuring from about 1/3 mile to 1.5 miles long. The Peninsula sector is being improved with two new trails--Los Miradores and El Tororoi--that lead two great lookouts and a 26-foot observation tower. It will also feature a new visitor center, cafeteria, and souvenir shop. Note: Off-trail hiking is not permitted. Access to Cerro Chato and the crater are prohibited; entering these zones is illegal and can result in penalties. Lava flow is inconsistent (there hasn’t been much more than steam and smoke since 2010), but when the lava is flowing, investigate which side has lava (it has alternated over the years), then book a hotel there. Watching red-hot lava flows from your hotel room is spectacular! Temperatures generally fall in the 23-32 C (75-90 F) range. There are two main seasons: dry (November-April) and wet (May-October). However, given that the area is mostly rainforest, clouds are common year-round (and often cover the volcanic cone), and rain is possible at any time. Arenal Volcano National Park is popular with visitors year-round, although your chances of sun and clear skies are better during mornings in the dry season. Always carry lightweight rain gear. The volcanic cone is partly rainforest, partly old lava flows. The greater park is about a third primary rainforest, with the remaining landscapes comprised of secondary forest, farmland, scrub brush, and volcanic badlands. With habitats so rich and varied, wildlife abounds. An estimated half of Costa Rica’s land-dwelling vertebrates live in Arenal Volcano National Park. Wildlife sightings often include white-nosed coatimundi, sloths, spider and howler monkeys, and white-tailed deer (Costa Rica’s national symbol of wildlife). More than half of all Costa Rica’s resident bird species, including the resplendent quetzal, can be spotted in or around Arenal Volcano National Park. Arenal Volcano National Park is located about 80 miles northwest of San José (2.5 to 3 hours’ drive) and 81 miles southeast of Liberia (2.5 to 3 hours’ drive). To get there, fly into SJO or LIR; stay in La Fortuna, Nuevo Arenal or Tilarán. Most guests visit the park on a private tour. No public buses run directly to the park (it only travels the main road, and it would be a hike into the park), but taxis from downtown La Fortuna usually run $20-$25. Arenal Volcano National Park has only one public park entrance, located about 1 mile west (and down a dirt road) of the famous Tabacón Hot Springs.